I’m looking for any information regarding the death of my 2nd Great Grandfather James Brooks, who was born 1827 in Posey County. I believe his death was around 1870 or so. His wife was Sarah Guthrie, 1833-1870. James’ father was John L. Brooks, 1806-1880, and his wife was Elizabeth Reeder, 1809-1846. Any information about James’ death would be very helpful. Thank you. Hello. 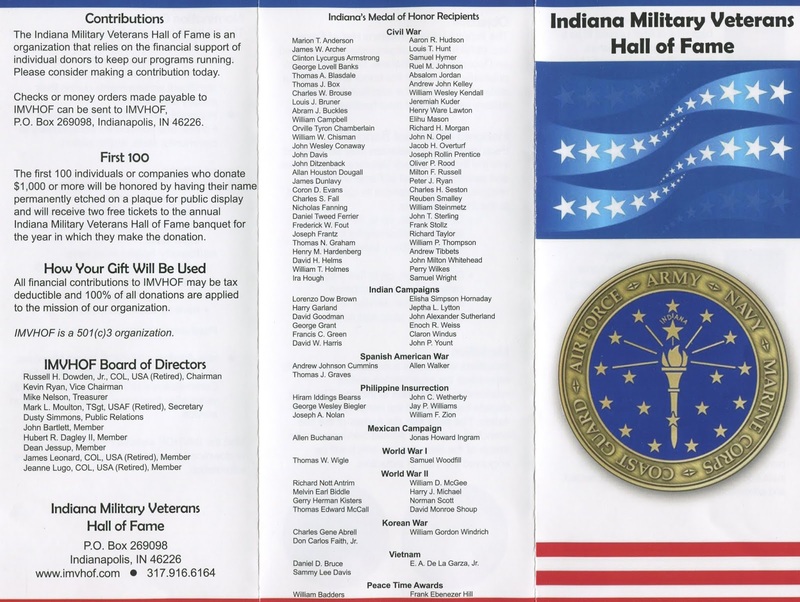 I am looking for information regarding my late grandfather's life at an orphanage in Indianapolis. He and his two sisters I believe were orphaned by their father, Franz, Senior from Aurora, Indiana. If you have any archives regarding my Grandpa Frank (Franz) Rink's life, and whether or not his sisters were ever adopted, it would be greatly appreciated. Thanks! The Indiana Genealogical Society is pleased to announce that it was awarded the Outstanding Society Technology Award from the Federation of Genealogical Societies. The award recognizes "a tech-savvy FGS member society for its website, online presence, social networking, blog, or specific technology related project that provides examples and ideas from which other societies can benefit." 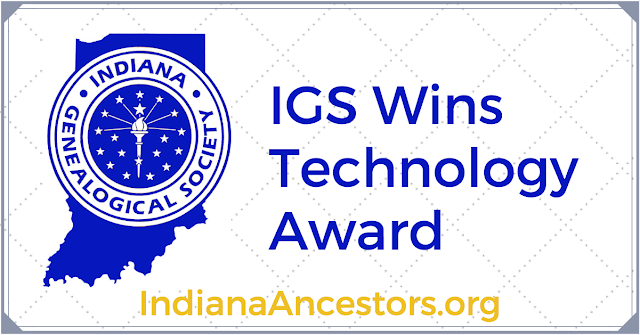 IGS received this award for its Indiana Genealogy Digitization Project, which helps Indiana non-profits digitize local records. In turn, these records are also made available for free on the IGS website. 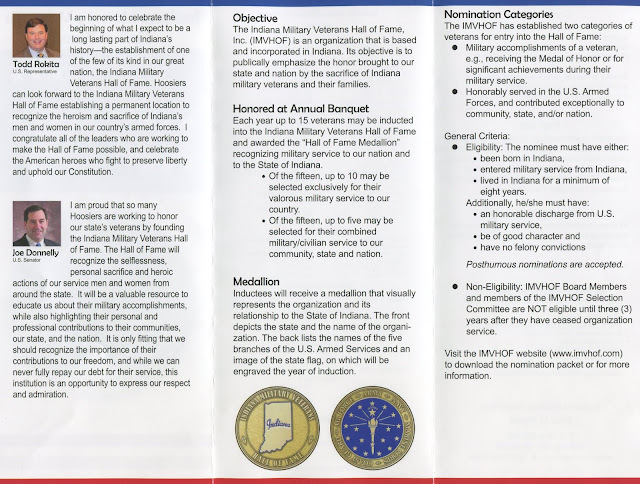 If your organization has records that would be of benefit to Indiana genealogists, please review the Indiana Genealogy Digitization Project page to see how you can apply for a laptop, scanner, and other equipment. You can honor your family's Indiana veterans by adding their information to the new Indiana Hall of Fame. There is a new building at 5360 Herbert Lord Road within Fort Harrison in Indianapolis. They also have memorial bricks available. Check it out! I have been trying for some time to find the birth certificate for my grandmother, Ina Aurora/Amanda Dyer. According to my information, she was born in Vilas, Indiana which is in Owen County. Her date of birth was April 5, 1886. When she and my grandfather married in Athol, Idaho, on June 28, 1905, her name on the marriage application and the marriage certificate was Ina Aurora, not Ina Amanda as she was called most of her life. Her mother was Sarah Elizabeth (Sally) Neill/O’Neill (born 1854 in Indiana). Sally's family had deep ties to Indiana for many generations. Her father's name was Henry Edward Dyer (born 1849 in Virginia). Sally and Henry Edward had several children born in Vilas, Owen County, but I can't find any birth certificate information about any of them. I am looking for any and all information on Jesse Mathews (Matthews) and Alice Weddle. They were married in Jackson County, Indiana, on the 18th of November 1840.